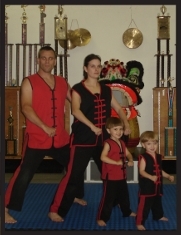 Our Family Style Kung Fu program offers All the Benefits of our other Kung Fu classes, but allows parents and children to learn and grow together. We firmly believe that The Family that Kicks together, Sticks Together !! This program is specially designed to allow Adults, emerging Adults, and children to improve their physical selves while bringing the mental and emotional well being that is so often missing in life today. Children and adults alike will learn fun and interesting methods of enhancing their ability to pay attention, follow directions and how to be successful in all your daily activities, as well as the skills of Self-Defense. Through the movements and techniques of Kung Fu we learn in fun and exciting ways. Each class is approximately 55-60 minutes long and designed to give your family the gifts of better health, increased confidence, greater focus, and good sportsmanship. Effective Self-Defense and improving their overall family dynamic. At Twin Dragon our Teachers have undergone vast amounts of training to prepare them to teach you and your children in the very best way possible. Not only are we highly skilled in the Martial Arts, but we are also Teachers licensed by the state of NH. 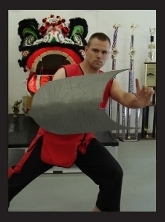 Sifu has been teaching Martial Arts for 19 years, and has 10 years experience as a public school teacher. 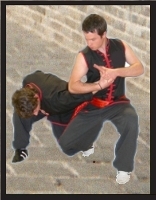 Simo has been assisting Sifu for 15 years, and has 7 years experience in the public school. That combined with the experiences we have as professional Martial Artists and with our own children allows us to offer training that is second to None.